Today in part two I'll show you some of the amazing and beautiful median irises that I saw when I visited the Aitken's Salmon Creek Garden last spring. We were there at just the right time for these smaller beauties to be showing off at their best. First up is an Intermediate Bearded (IB) iris, 'Backlit Beauty' (Tasco, 2010) and what a bright splash of color it is! 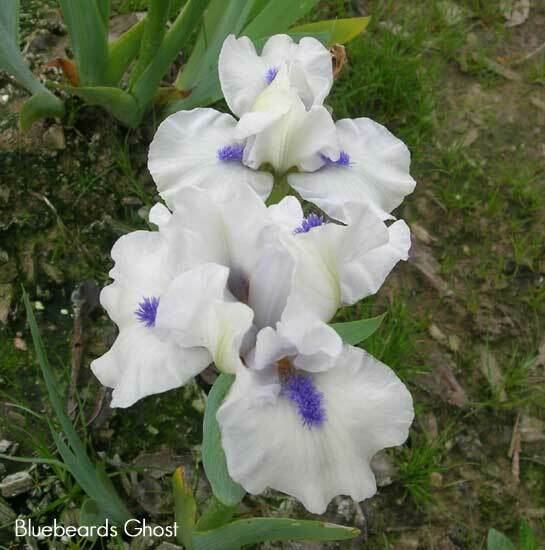 Next we have Paul Black's award winning SDB 'Bluebeard's Ghost' (2006). A nice pure icy white with a strikingly deep blue beard. 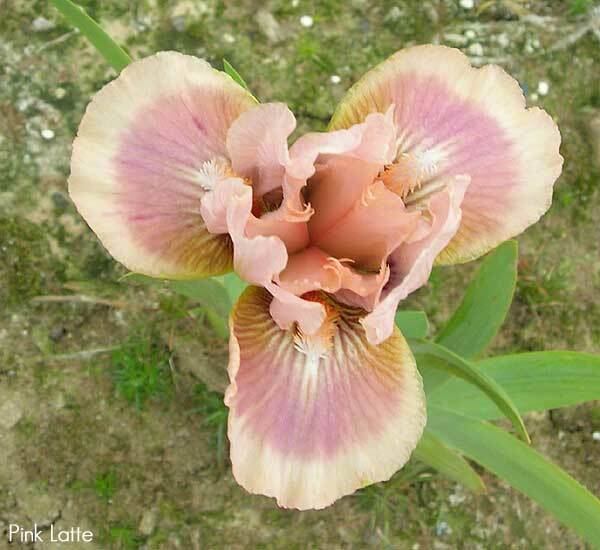 Another SDB with quite a different color pattern is the Aitken's own 'Pink Latte'. Intermediate Bearded (IB) variety 'Red Hot Chili' (M. Sutton, 2005) was a knock-your-socks-off combination of bright red and gold. Terry and Barbara have a beautiful collection of Miniature Tall Bearded (MTB) irises and many were showing off during our visit. I love their small tailored flowers. They seem very simple and graceful in their beauty. First is 'Dollie And Me', a 2011 introduction created by L. Miller. 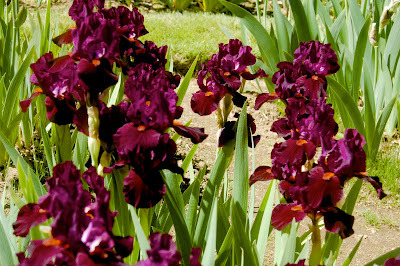 A truly wonderful color combination and a real standout in the iris rows. Another MTB with a harmonious combination of colors is 'Please' (Craig, 2005), with soft yellow standards over white falls blushed violet on the edges. An unusual color combo is found in 'She's A Doll' (L. Miller, 2010). 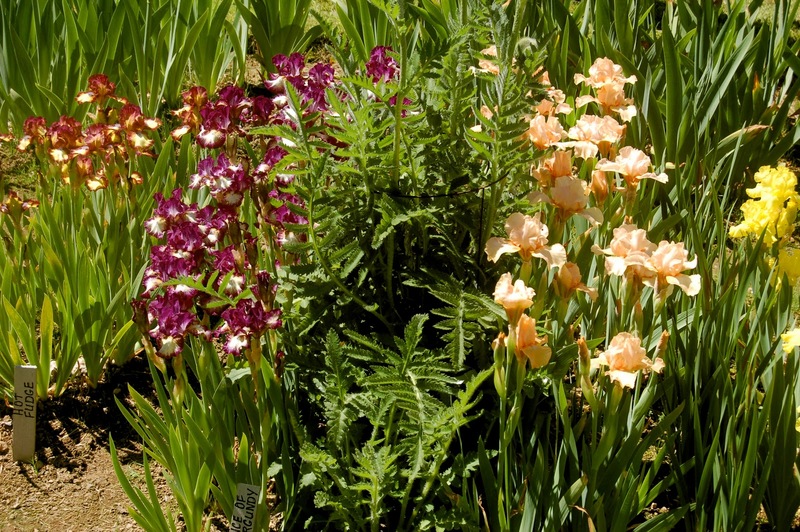 It features soft coral pink petals with the falls lightly washed with orchid pink. A very pretty effect. Last, but by far the least, is 'Think Spring' (S. Markham, 2003). What a delightful flower this is, with it's soft lavender-violet coloring paling at the heart. 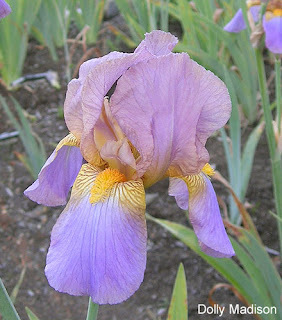 Tomorrow we'll take a look at some of the stunning Pacific Coast Irises that the Aitken's grow. Stay tuned! Last spring I took a trip south to Vancouver, WA, to visit Aitken's Salmon Creek Garden. I had been to the garden of Terry and Barbara Aitken once before, when it had been one of the gardens on the tour for the 2006 AIS Convention in Portland. That trip was at the height of the TB season and the fields were full of color. This trip was during an incredibly late bloom season so I was fortunate to get to see lots of medians and species varieties that are usually gone by the time the TBs get going. This week I'll have a five part series of posts for you highlighting the beautiful blooms I saw there. I hope it will whet your appetite for spring as it draws closer. Enjoy! 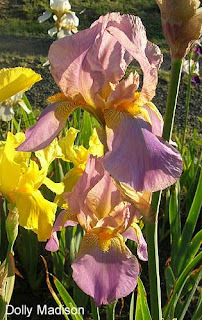 Today I'll start with a few historic bearded irises that I photographed. These are varieties that are still here from Bruce Filardi's collection that I so enjoyed at the 2006 Convention, and are not stock sold by this garden. First up is 'Junaluska' (Kirkland, 1934). 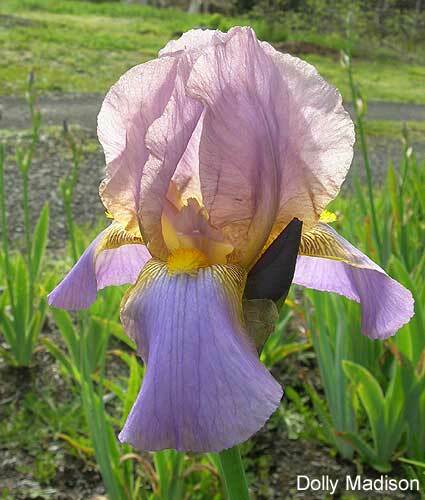 A beautiful, tall, glowing iris, it won an HM in 1936 and an AM the following year. Well deserved. I love the wash of rose in the standards and that dark red wire rim around them. 'Messaline' is an old French variety by Millet et Fils, introduced in 1927. It's small flowers are quite charming and display a complex pattern with delicate gold pencil lines decorating the edges of the orchid standards and falls washed and stippled heavily in red-violet, with gilded hafts and a golden beard. Last is a pretty tall bearded variety from 1967 by Wright - 'Many Moons'. It is a creamy white self with just a touch of lavender to the fall. A really lovely iris. I hope you enjoyed these. Please come back tomorrow for part two: Medians! Every once in awhile we find an iris that is so perfectly suited to its name that we couldn't picture it being named anything else. 'Perfection' is just such a variety. True to its name it is practically perfect in every way, with exceptional color, flawless form, vigorous growth, beautiful foliage and reliable blooms. It is as lovely as a single stalk as it is in mass plantings. A creation of Peter Barr, it was introduced in 1880 making it 132 years old! 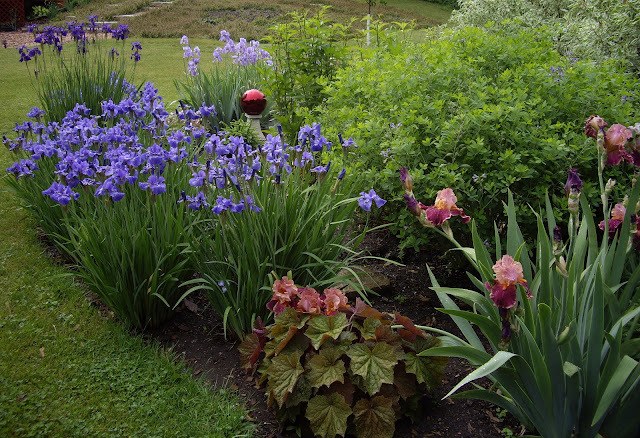 Few irises have managed to remain fantastic garden plants over that period of time. The blooms of 'Perfection' are of the neglecta class, meaning it has light lavender-blue standards over falls of a deeper velvety purple, accented with a golden beard. The falls have a really nice flare to them that you rarely see on the oldest varieties, and it gives them a jaunty, cheerful aspect. 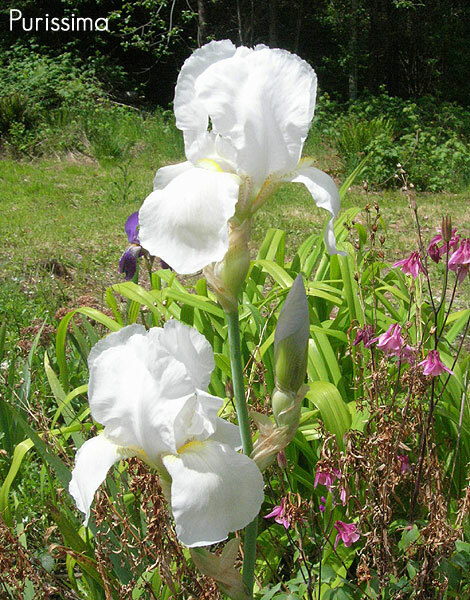 It is a tall variety as well, growing about 30 inches. 'Perfection' is that rare iris that is so versatile it can be used by any gardener no matter what their focus. It will excel equally at giving you a show quality bloom stalk to bring indoors, a lovely clump in your perennial border, or a mass planting all along your driveway. This classic iris is one you will really enjoy in your garden. Established irises usually resist freeze-thaw cycles handily, but newly planted seedlings and late-transplanted adult cultivars are vulnerable, especially if the winter is very wet. It can take months for the dirt in newly planted beds to settle and compact. During this time, the sun, Jack Frost and the rain can combine to coax the plants up to where their roots are exposed, to be cooked by the sun. A good precaution is to cover those vulnerable beds with 1-2 inches of finely shredded wood mulch just after the first hard freeze of the winter. What the mulch does is provide a sort of insulating blanket over the roots, absorbing/deflecting the winter sun, tending to keep the temperature below the mulch more even during the 24-hour cycle, and shielding the roots from direct rainfall. You'll have to remove this mulch in spring, of course, but you'll have saved your plants. 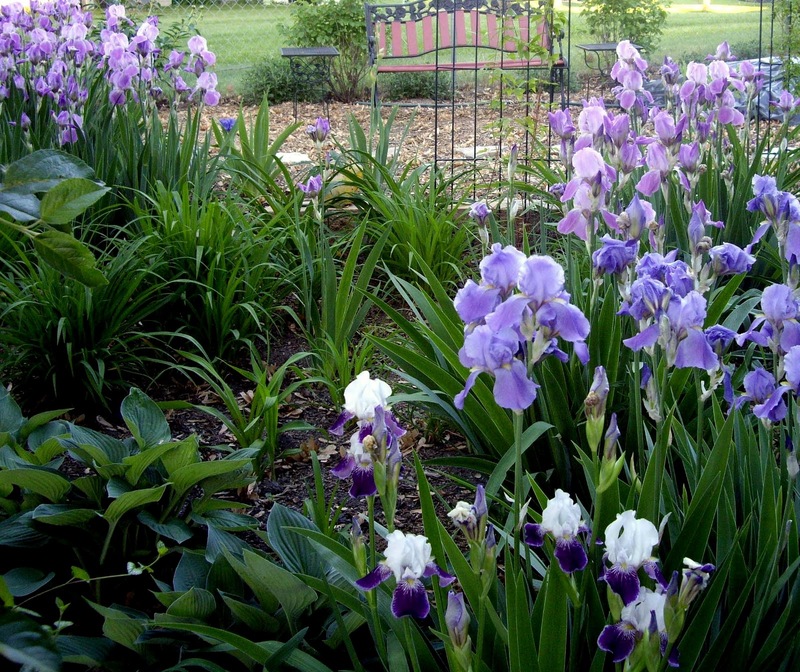 Irises are the ultimate collector's plant. Those of us smitten with the "iris virus" drool over the newly introduced varieties in iris catalogs, surf the online catalogs of iris sellers for hours, and compile endless lists of irises we must add to our ever-expanding collections. 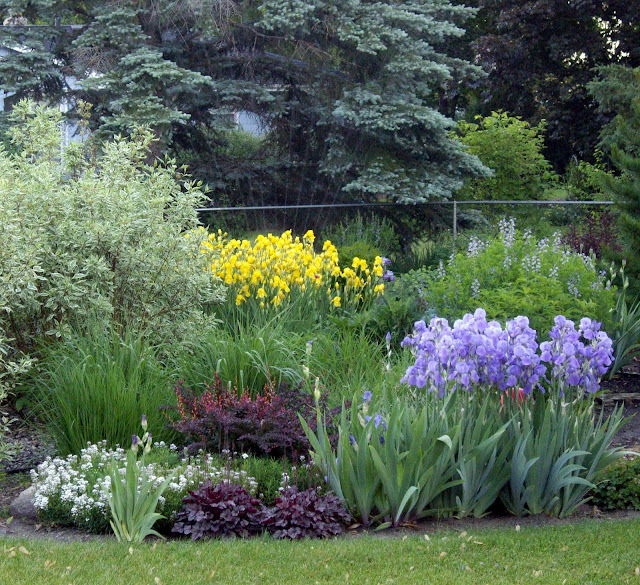 As a result, there is very little space in our gardens for mass plantings of a single variety. We divide our clumps and keep them small to conserve precious garden space for the flowers arriving in the next order. This predilection of iris lovers makes it unusual to see a single variety of iris in a mass planting in the garden. What a shame. There is nothing as breathtaking as a garden filled with masses of flowering irises. 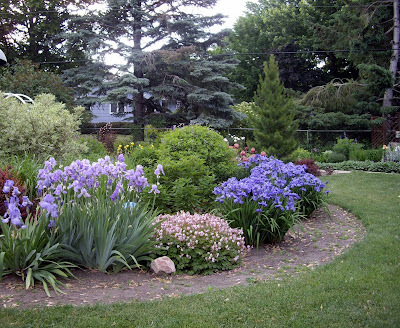 Marte Hult has elevated the use of mass plantings to an artform in her Minnesota garden. Marte has been gardening at her home since 1974. The garden came equipped with a few "noid" historic irises. 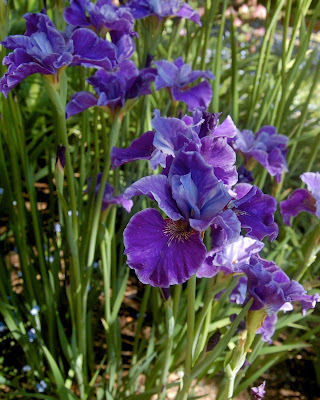 (For the novice iris grower, noid means no I.D., an iris whose name is lost or unknown.) Marte's noids have proliferated since, and form the backbone of a spectacular spring display in her garden. Sometimes a noid is the result of a nursery or gardener mix-up. This may be 'Cranberry Swirl,' or maybe it isn't. Either way, its value in the garden is unmistakable. Marte also grows modern tall bearded and Siberian irises en masse. 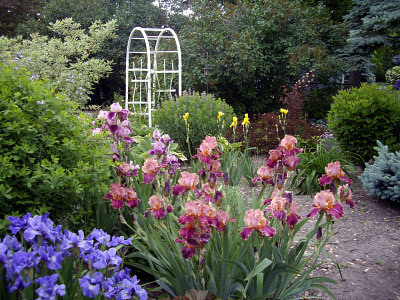 Here she uses 'Impressionist' tall bearded iris to excellent effect with Siberian irises. 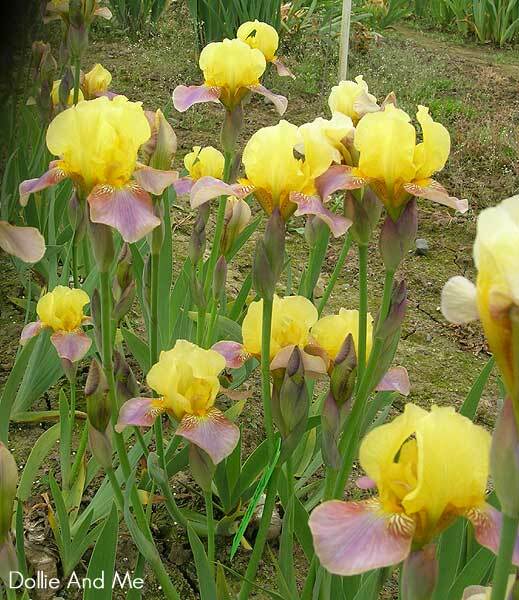 Marte with her noid yellow historics: irises that will take your breath away. 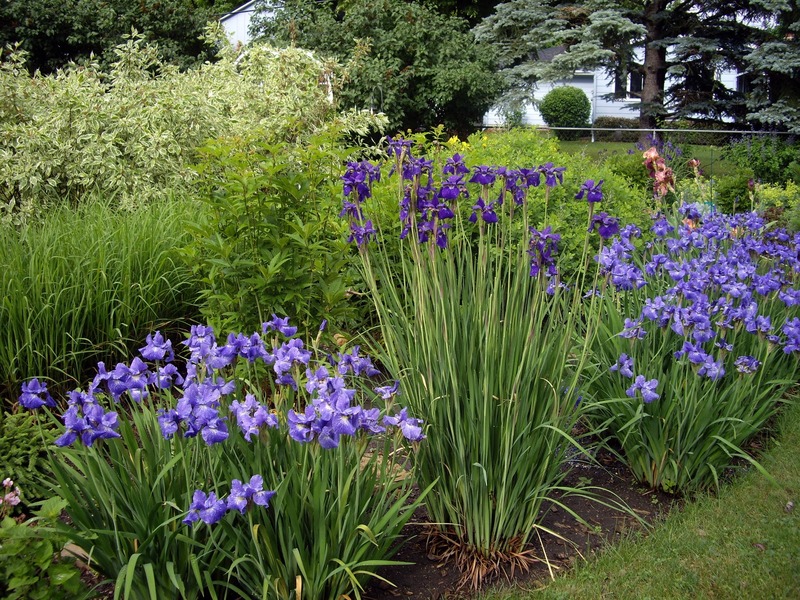 Do you have a mass planting of irises? If you get the time, take a photo of it and send it to me at renee.fraser@gmail.com and I will put them together on this blog. 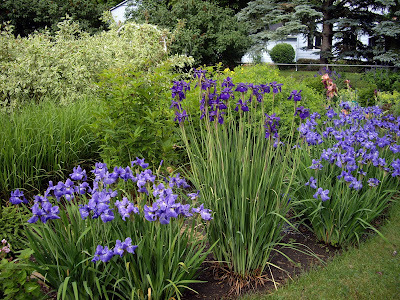 We'll have a nice show of irises to keep us all going until Spring bloom. 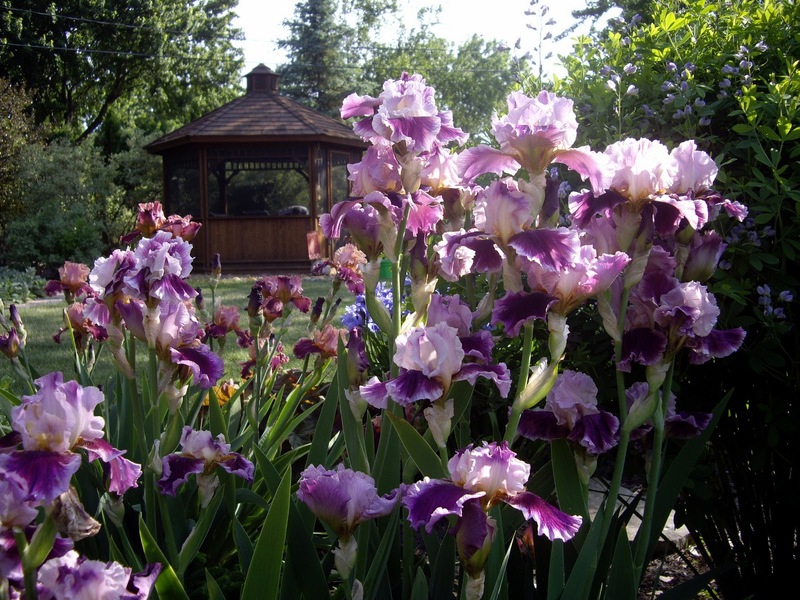 Cooley's Gardens catalog for 1937 described it as "Without doubt one of the best irises ever originated and one of the most popular in the country." 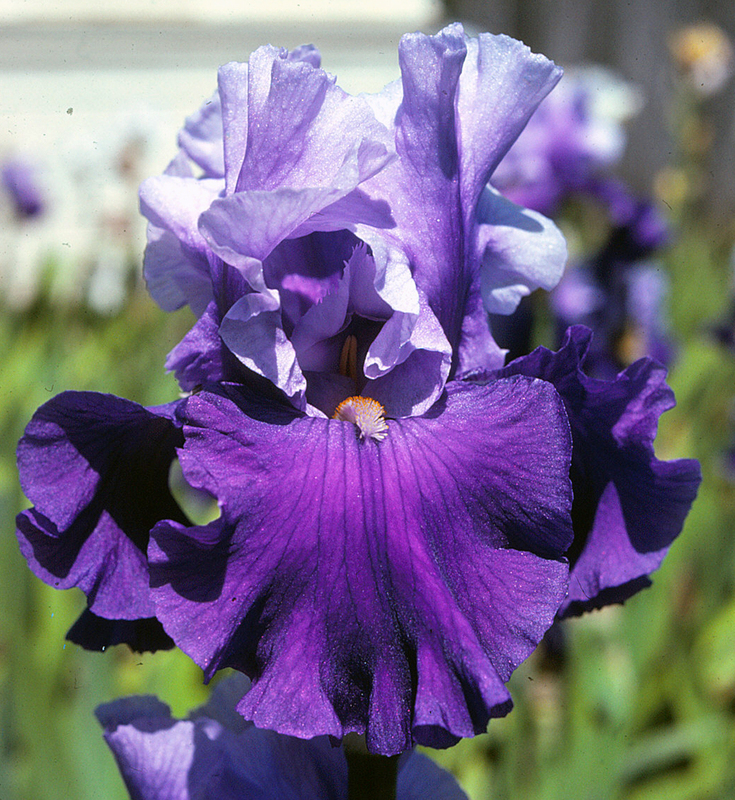 Robert Wayman's catalog in 1940 stated "The exceedingly high rating given this new blend places it in the highest rank as one of the world's finest Iris." 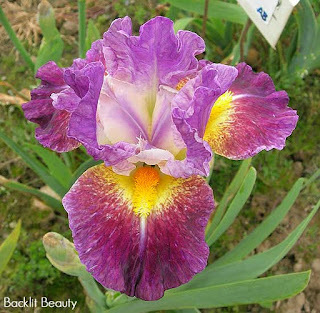 They were speaking of the wonderful old iris 'Dolly Madison'. This classic variety is very tall, easily reaching three feet in my garden. It is hardy everywhere, has excellent growth habits and blooms reliably. The strong stems carry many large blooms beautifully. The flowers themselves are a lovely combination of soft mauve standards over lilac falls, with bright gilded hafts and an orange beard. In shadow it is a somber palette, often being described as having a touch of grey to it, but in sunlight it glows with pink and gold tones. It is one of the masterful creations of E.B. Williamson, of Bluffton, IN, and was introduced in 1926 to wide acclaim. 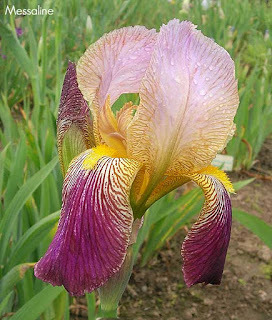 Why such a well regarded iris did not garner higher awards than an Honorable Mention in its introductory year is a mystery. "Tall bearded. It is free flowering and vigorous in growth and has been admired without exception by all who have seen it. We believe it will become one of the most popular of all Irises. It has a distinction of carriage and form that will appeal to all Iris lovers. Height 36 inches, stalk well branched, 7 to 11 flowers. Flowers large, 4½ inches high and 5 inches wide. Standards arching cupped; very broadly obovate; Mauvette shading out to yellow at the base. Falls flaring; very broadly wedge shaped; Lilac, haft golden tinged and Maroon veined; beard bright orange. Style branches Mauvette, sides yellow. We have raised many thousand seedlings with Lent A. Williamson as seed parent and of these we have under observation at the present time about 100 varieties. Dolly Madison is our first introduction from this series." 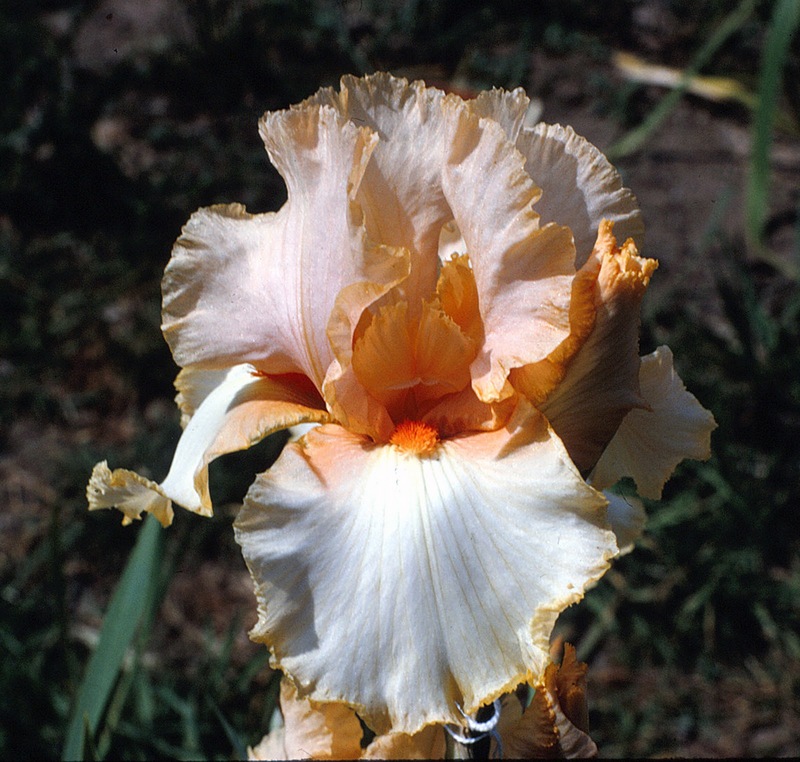 When Mr. Williamson was looking for a name for his new creation its similarity in coloration to another classic iris called 'Quaker Lady' gave the inspiration to name it for the beloved First Lady, who had been raised a Quaker. It was a fine choice and a fitting tribute. 'Dolly Madison' was at the top of the favorites list for many years after it was introduced. 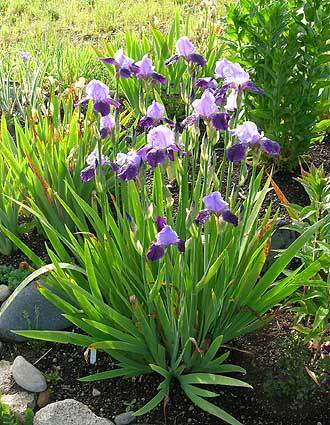 It was not only a great all around garden plant, but was used by many hybridizers and became an important variety for later improvements in irises. For instance, it was one of a few varieties that were integral in founding Dave Hall's breeding program that brought us tangerine beards and the famous 'Flamingo pinks'. 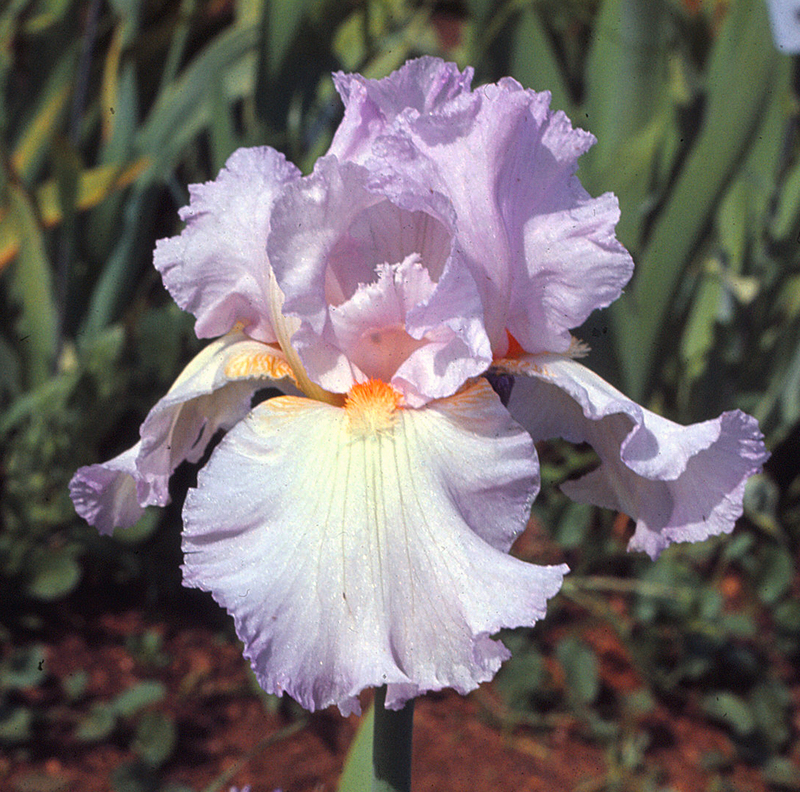 All of its acclaim and high regards were well deserved, and 'Dolly Madison' remains a true iris classic. Update: Via Facebook, Jim Morris tells us: "It is interesting to note that although this was supposedly named for President Madison's wife, hybridizer B.F. [sic] Williamson misspelled her first name. She spelled it Dolley not Dolly"
Here's the scoop: this is a wonderful issue of Irises, and if you can, as much as possible, you should share this delight with your friends and family. If you are receiving this via Facebook, be sure to click on the link to see the original blog post, you'll be glad you did. The front cover, a picture of 'Cajun Rhythm' that Rene Fraser took at her Southern California garden is spectacular. I don't really know how anyone looking at it cannot be moved. Also, if you click on the blog post you will see a much larger picture than you would on Facebook. 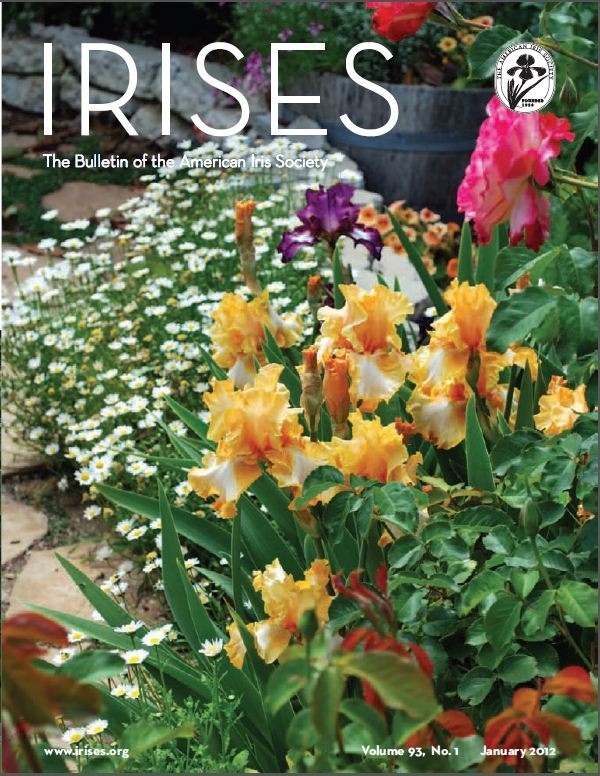 American Iris Society members registered for e-membership already have access to this great issue via our website, and for those who receive it via mail, the issue is on its way. Be sure to give us your feedback, comments and article recommendations in the Comments section below, via Facebook, or write to us. The most interesting patterns in irises for me has always been the plicatas. I have always had lots of success with crosses for these patterns and lots of surprises along the way. I will, however, be truthful when I say that some patterns just aren't particularly hot sellers in the commercial world. I look at other hybridizers work and I am very impressed with new accomplishments and I am anxious to add them to our retail growing fields to sell. Many times I am disappointed when they don't sell in any volume. As a hybridizer and retail grower, I have learned to understand this quandary. 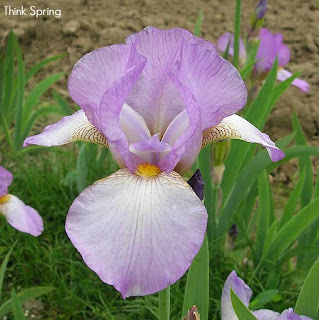 New advancements in iris breeding aren't always popular, but they are so important to the overall iris industry. I guess you can say I am a hybridizer that has a few years under my belt. 2012 will mark my 32nd year to be dabbing pollen. I think after all of this time, I have settled down to where I want to go with my efforts. Several years ago I really started working with plicatas. My first crosses were made with wild color combinations. Pink plicatas on purple, brown on purple, etc. My first surprises were, these seedlings were not ugly. Many came in colors that were very pleasing to the eye and many came in color combinations that I knew already existed. At this point, I realized that someone had already tried some of these crosses. Next I began to look at the borders on introduced varieties and my seedlings. I found out there are plicatas with borders of two colors. Some of these can be quite definite in contrast. I talked to other hybridizers and most said yes, they also had noticed the borders, but most had not really worked alot in that direction of hybridizing. So my goal was established. I wanted to try to produce plicatas with several distinct bands of different colored borders. Again, I was told by some hybridizers, it was no big deal, because they already existed. No, they don't exist like I want them to be. I want the falls on plicatas to have two or more, wide, distinct, color bands that are a knockout contrast to the basic fall color. My thought is to cross some of these wonderful new banded bicolors that are now on the market with modern plicatas and roll the dice. My crosses are already made and being grown off. The first seedlings will bloom this year. There has been some discussion in hybridizer circles that the position of plicata markings on the petals can be transferred in crosses. In other words, a plicata with narrow color borders very close to the edges should throw some seedlings with the same defined edges. I have a new seedling, R-125-A, that has a very defined plicata pattern around the beards only. I have made a number of crosses with named varieties of plicatas that have definite bold plicata edges and clean backgrounds around the beards. These seedlings should establish my theory as to whether the two patterns on the falls can be combined into one. In my opinion, these seedlings will open the door to many new possibilities in plicata patterns. Many plicata varieties already exist that have patterns in varying positions on the falls and standards. Ask any knowledgeable tall bearded hybridizer where the future is headed and they will tell you that plicatas are the answer. If you are starting out in tall bearded iris hybridizing, get on the boat, you won't be sorry. God Bless you and your gardens and thanks for listening. 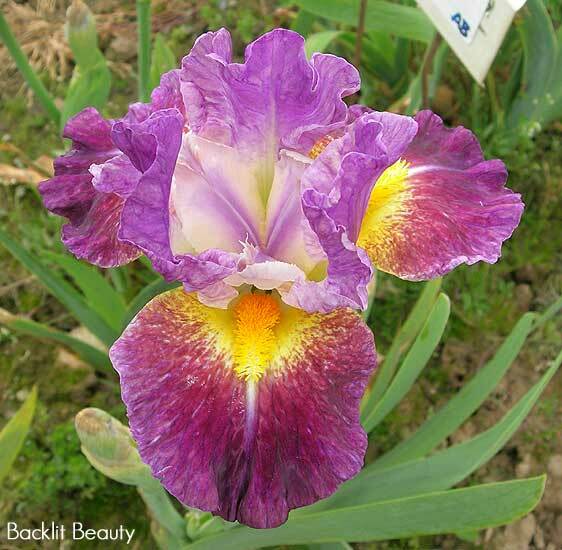 Sometimes an iris variety comes along that is simply revolutionary, thru its beauty and genetics it inspires hybridizers, and it becomes a focal point for further improvement. 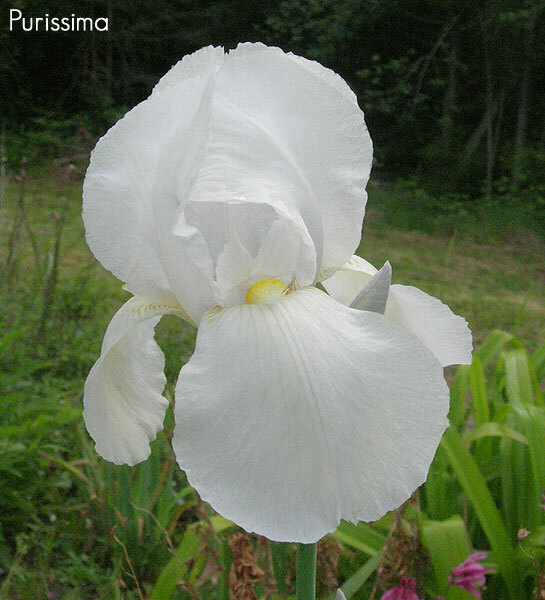 The classic iris 'Purissima' may be the quintessential example of this, as most every modern white or blue iris has this variety somewhere in its background. 'Purissima' is the result of a cross between 'Argentina' and 'Conquistador', which share the pollen parent mesopotamica using pod parents 'Caterina' and 'Juniata', respectively. It was created by William Mohr and introduced after his untimely passing by Sidney B. Mitchell, who recognized its outstanding features. 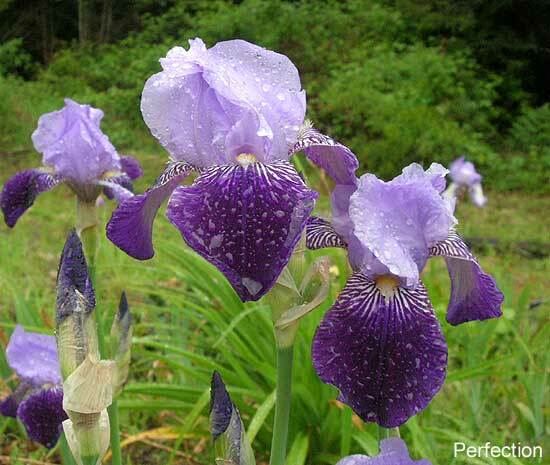 "This splendid flower still sets a mark of perfection and purity unequaled by any other iris. A pure white of great poise, fine form and heavy substance. With the sun shining through it, this has the appearance of frosted glass. Ideal branching. Early. 50-inch." As renowned as 'Purissima' is in its own right it is even more important for the progeny created from its genes. 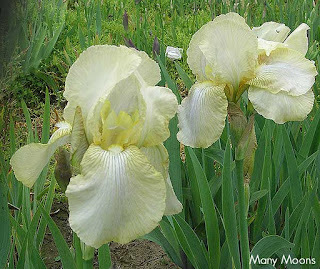 The most famous is probably 'Snow Flurry', which is in the background of most modern tall bearded irises and may arguably be one of the most important varieties in the history of iris breeding. Not to be overshadowed is Eva Faught's light blue 'Cahokia' (from a line involving 'Purissima', 'Santa Barbara' and 'Santa Clara'), which was one of the main progenitors of both the modern blue lines and whites as well. 'Purissima' is another classic iris from the amazing gardens of Mr. Mohr that were saved by Mr. Mitchell, and our modern iris palette would be poorer without their efforts and keen eye. 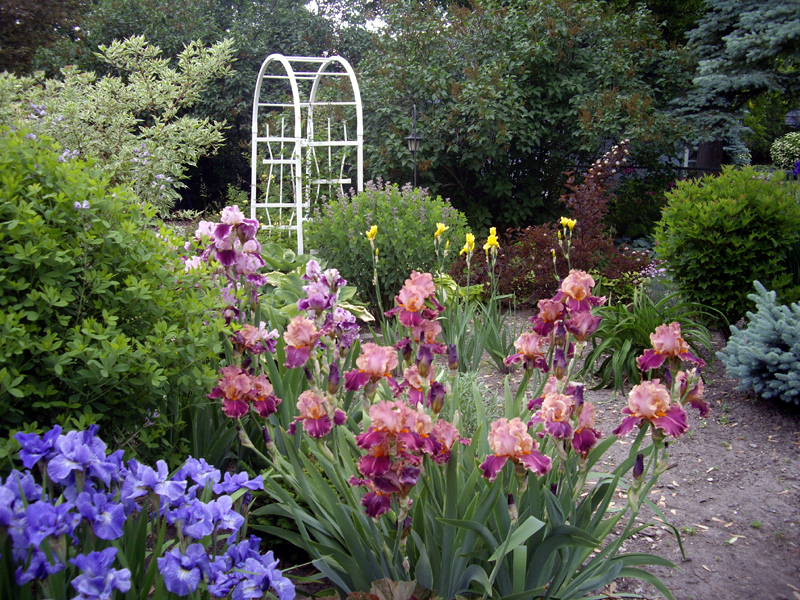 Its importance in iris history can't be overstated, and it remains today a wonderful garden plant for those in climes where it is happy. In a time when even the accomplishments of the American Iris Society's prominent leaders and hybridizers from the past are dissolving into the mist and are being lost since they have not been written down or recorded in oral histories, the role of Sir Andrew Aguecheek's lesser folks--the people who were so important on a local level to irises--in shaping the future has been totally overlooked. As I look back on 50 years of AIS membership, I am impressed with the role of the kindness of others, but few of those people are even remembered by their local societies. A major hybridizer in his own right, David Hall helped so many other people through the kindness of providing seedlings for others to use. In the 1930s many thought that really pink irises were impossible, but not David F. Hall of Wilmette, Illinois. Over the years, he did create pinks and became known for his famous flamingo pink lines. Not only did he expand the iris color pallet, but he also was kind enough to allow others to use his seedlings along with his named varieties. From his early work and from his kindness of sharing his breeding work with others, another generation would build—in Illinois both Orville Fay and Nate Rudolph would, justifiably, become famous for their pinks; in Utah Tell Muhlestein had access to Hall's seedling 42-10 and created his wonderful pinks June Meredith, Pink Enchantment, and Pink Fulfillment. Today we tend to think of Maynard Knofp's role in hybridizing, but his wife Mary Ellen started the Knopf lines that were later to blossom under Maynard and one of the youngsters of the day that visited the garden was from Santa Cruz—Joe Ghio. When Paul Cook's Whole Cloth was new, rare, and expensive, Mary Ellen gifted Joe with an anther of pollen—note that due to the scarcity it was one anther. He took that home and used it, later introducing Mount Eden--one of the foundation parents of his bicolor lines--and was started down the path that would later result in his Dykes winner Mystique. It was due to the kindness of others. In my own case as a young teenager interested in irises, I did not have the money to buy new introductions—mainly offered at that time at the princely sums of $20.00 and $25.00 each. At one of the first Clara B. Rees Iris Society shows that I attended, Dr. Maurice Peel, a former local president and dentist, gave me the stalk of the new and expensive Rippling Waters to take home. 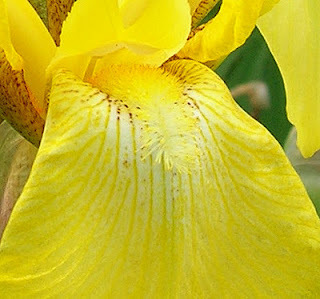 I did take it home and when new flowers opened used the pollen on Dawn Crest—undoubtedly an iris that Bernice Roe had given me—and that was the start of my Words of Love line. Although events and my memory have misted the past, I strongly suspect that Bess Harbour, one of Hazel and Auda Steward's sisters, gave me Mary McClellen and when I used that first with Whole Cloth and then the resulting seedling to the premier blue plicata of the day, Rococo, I was started down the road to neglecta and bicolor plicatas. My last introduction, Shades of Meaning, traces back to Bess's kindness. Bess was always willing to have me come and visit and talk irises, though that meant my parents had to have errands in that part of town (when San Jose still had a viable downtown) and I was always welcome except when she and her husband, Roy, were listening to baseball games on the radio. The little acts of kindness turn out to be like stones dropped into water—they ripple out and have effects over decades. 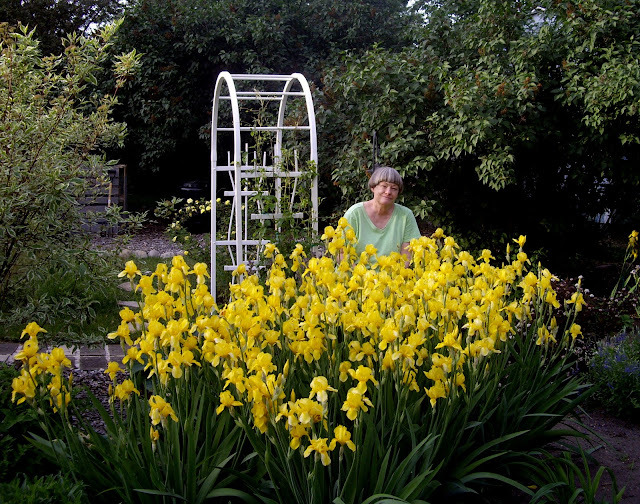 Yellow irises were always a popular hybridizing goal in the early years and many were introduced. 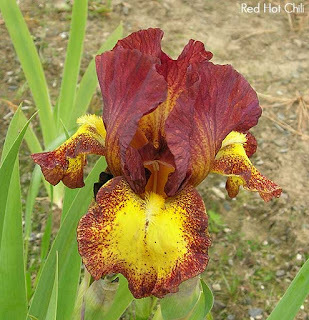 Most were small flowered and short and breeders worked for decades to deepen the color, enlarge the flowers and add height to the bloomstalk. It was slow going. One of the best early ones was 'Coronation'. A creation of Mrs. John Beverly (Connie) Moore of Benton, IL, it was introduced in 1927 to rave reviews. Tho not a large flower it was larger than most yellows of its day and it had two other traits going for it as well - height and color! In my garden it will bloom early on stalks around 40" in height. 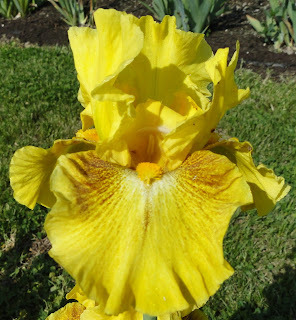 A reliable bloomer, the flowers are profuse and in cool temps are a very deep golden yellow, while buds opening in warm temps tend to be lighter. The beards are a matching shade of yellow. Because of the profusion of blooms it tends to put on a long display. It is a wonderful variety for mass plantings in long drifts. Another feature, which some may think detracts, is the tendency to have a light dusting of purple freckles around the upper fall area. They seem more prominent during cool temps and not so noticeable when buds open on warm days. I think they are cute and always watch for them. 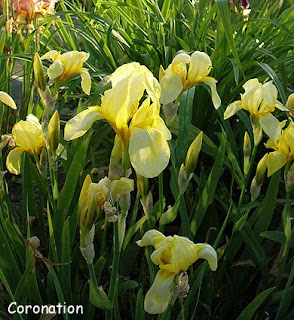 'Coronation' is a very hardy iris that thrives just fine in neglect and so is often seen growing around the US. 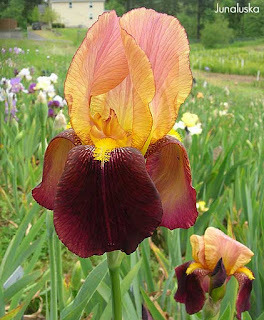 It is one of the most common irises sent to me for ID. This would be an ideal variety for those with very tough climates. In addition to the wonderful traits already mentioned it also has great purple based foliage (pbf) which adds interest even when the flowers aren't around. 'Coronation' has it all, and is truly an iris classic. 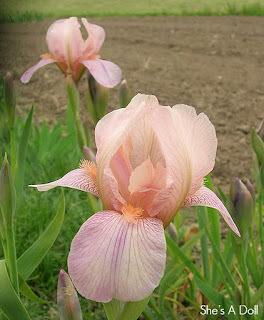 Iris magnifica is a bulbous iris in the subgenus Scorpiris. 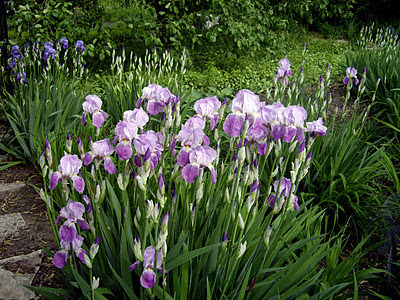 These iris are best known as Juno iris or just Junos. 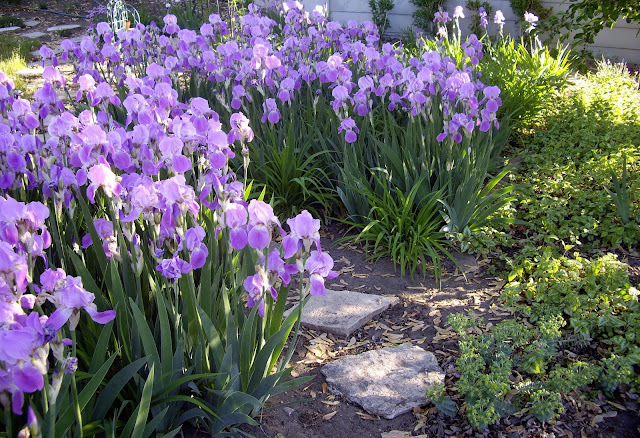 Iris magnifica is the largest of the Junos often reaching over two feet tall. It flowers in late March to early April in Kansas City, Missouri with up to seven flowers per stem. Each flower has large falls with pronounced 'wings' at the hafts and large, upright style arms. The standards are small narrow and weak and usually relax inconspicuously between the falls. It thrives in my climate and has survived -20ºF without snow cover in winter and well over 100ºF in summer including the occasional summer thunder storm. 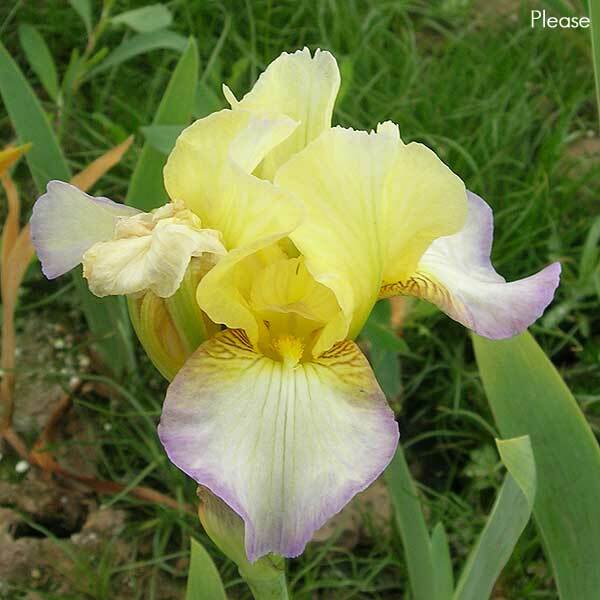 Many people upon seeing a Juno iris for the first time will remark on the superficial similarity with a corn plant. Indeed the alternating ranks of vee shaped leaves do resemble a corn plant and the flower buds appear to mimic ears of corn. 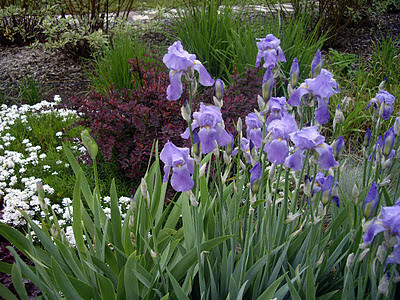 This iris is usually a very pale lavender or white with hints of lavender. The pure white form is called Iris magnifica 'Alba'. It is truly an arresting sight to see a large clump of I. magnifica 'Alba' in full bloom. This iris hales from the mountains of Central Asia and requires cold winters and good drainage to prosper. Surprisingly, this largest of the Juno irises is also among the easiest to grow, tolerating and even thriving in less then ideal conditions. 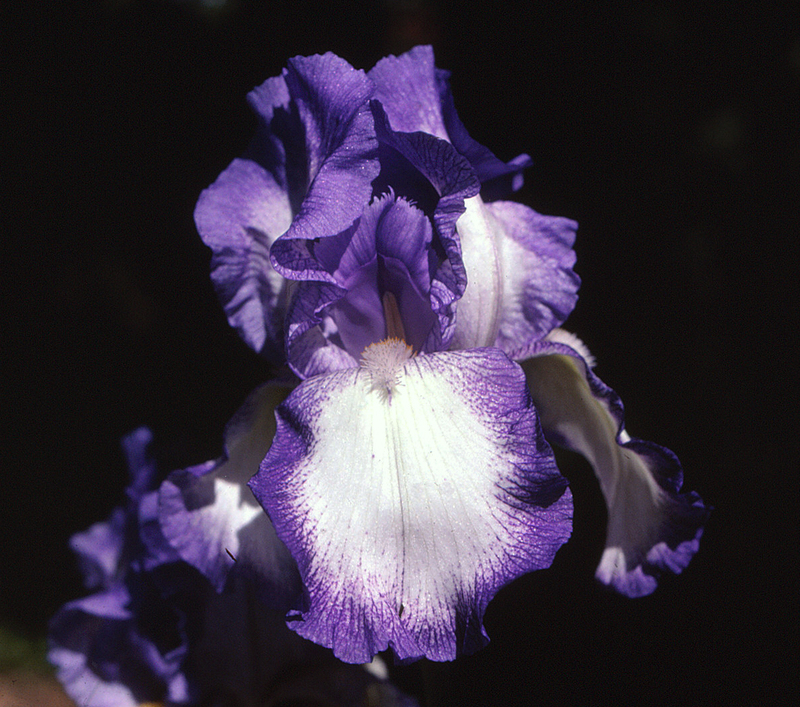 Although it is now one of the most common Junos cultivated it wasn't scientifically described until 1935 so it was unknown to Dykes when he wrote his book 'The Genus Iris'. I have never seen any insect damage on it but deer will browse it to the soil level and gophers can eat the bulbs. 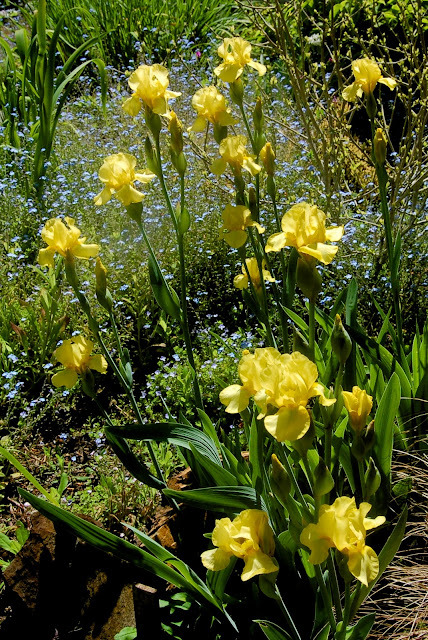 I. magnifica is relatively easy to grow from seed but bulbs are not expensive. Even in my tough climate, self sown seedlings pop up here and there. It also makes a regular appearance on the annual SIGNA seed exchange. Besides 'Alba' another common form is 'Agalik', a very light blue with excellent form. The forms are well worth seeking out but even seed grown plants are "Magnificent" in the garden. And the world turned once again, so we’re starting a new year. Hope you’ve had a chance to surround yourself with your loved ones during the holiday season, and that your list of New Year resolutions is one that includes receiving lots of love in your life. I wanted to take this opportunity to thank you for being part of our Word of Irises, and for your continuous support. March of 2011 saw the creation of this blog and an unexpected success. 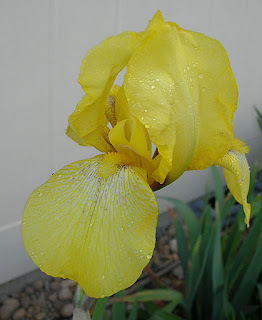 Just this week, this blog’s page views surpassed 20,000, which is a very significant sign about the interest on irises and one that we would like to react to in a manner that is meaningful to you, our audience. So, keep in touch, look around, make comments, and give us your input so we can bring better articles, better pictures and more of what you’d like to see. A most grateful acknowledgement to the actual bloggers without whose help the AIS Blog could no be possible: Mike Unser, Renee Fraser, Jim Hedgecock, Jim Murrain, Griff Crump, Debbie Strauss, Bob Hollingworth, Bryce Williamson and Betty Wilkerson. I also thank those that helped us even if temporarily. What is the meaning of this? Perhaps you can help us explain it. What does it tell us? We will be analyzing and sharing with you soon. In the meantime, it is 2012 and the countdown to spring has begun, which means, down in the dirt, into the roots, that energy that says “it’s time,” is brewing, bubbling, and so are the plans for a successful bloom in all of our gardens, and we, out here, can’t wait to see it all manifest itself in front of our eyes, once gain, in all it’s glory. All photos taken at Salt Spring Island's Baker's Garden during the Victoria Convention. For descriptions please click on names below. ‘Ruby Slippers' (Keith Keppel, R. 2002). 'Ships are Sailing' (Marty Schafer/Jan Sacks, R. 1998). 'Hot Fudge' (Ben Hager, R. 1982). ‘Prince Of Burgundy' (O. David Niswonger, R. 1992). 'Ask Alma' (C. Lankow, R. 1986). 'Easy' (Jim & Vicki Craig, R. 2005).